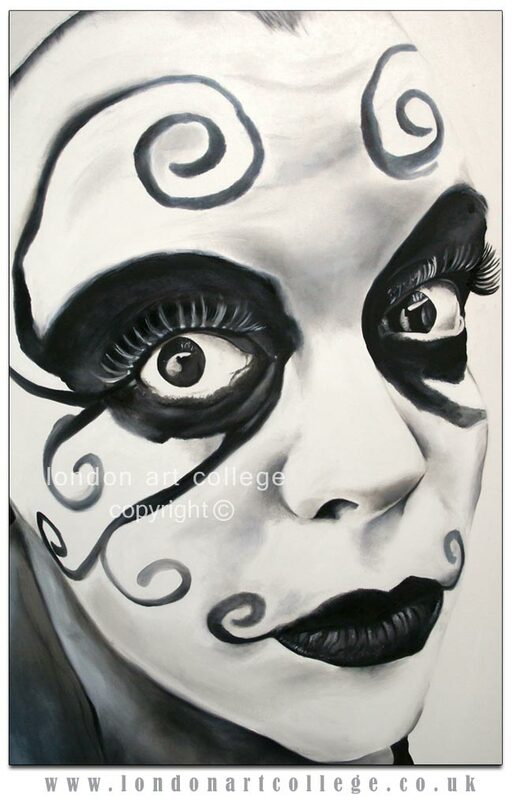 Drawing and Painting Diploma student…. Drawing and Painting Diploma Student Evelyn, chats about two pieces of her work below. We hope that you enjoy reading and viewing Evelyn’s artwork! One of my course assignments was to make a small painting in acrylic, gouache or oil in which I’d experiment with style. The syllabus had traveled through various art styles from pointillist to expressionist, impressionist, decorative, and abstract, so I thought about it and decided I wanted to try painting something decorative. 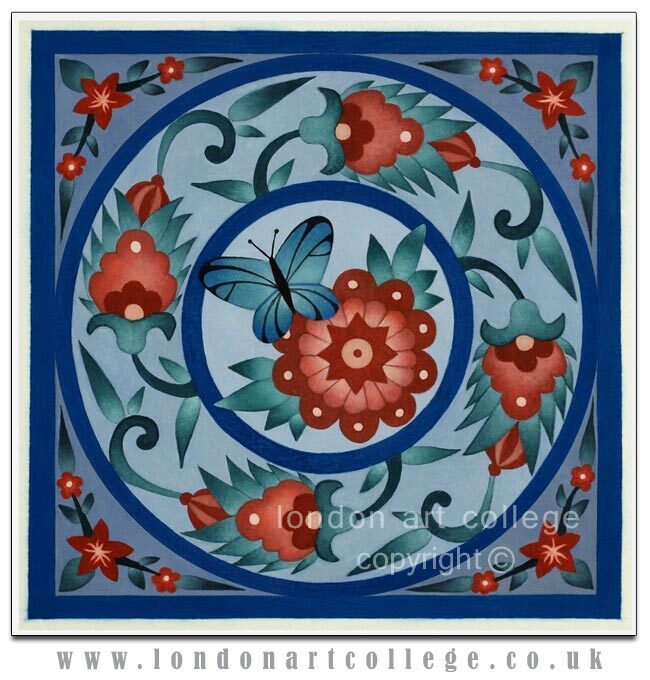 A few years back I’d seen some beautiful Islamic tiles which I’d loved, and my idea was to paint a tile in that general style. I looked at Islamic and other tiles online and found so much inspiration there. I then made my own design and color scheme and painted it in gouache. As it was my first time using the medium, that added to the challenge! My subject was winter fading into spring, hence the dark-into-light backround, the butterfly, flowers, buds and leaves. It was such a new experience for me and I felt I learned a lot. This was my first try at painting something semi-abstract. I wanted to paint the feel of autumn leaves blowing in the wind at sunrise. Trying to express a ‘feeling’ without having a photo or specific scene from nature to paint from was completely new for me, and meant a lot of thinking, imagining and experimenting. I first made a few sketches in pencil, then a color sketch in gouache, and at last the final painting in acrylic on canvas board. It was more difficult than I’d expected and I gained a new admiration for abstract artists after seeing how much went into even my simple painting. But I enjoyed it and hope others will as well. Announcing the London Art College 2011 Competition Winners…. 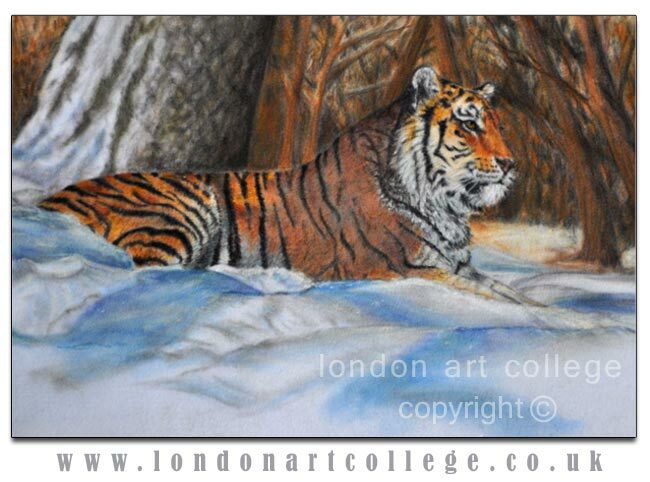 Congratulations to the winner and runner up of the 2011 London Art College Competition. We will be adding more information about the winners over the coming weeks so please check back to our news blog to read about how the students created the artwork and the stories behind the images. 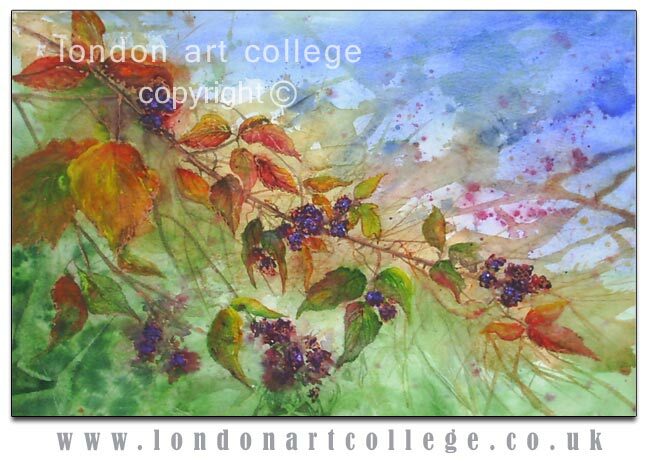 This watercolour painting was highlighted with raised copper relief. These blackberries grow in the hedgerows all around where I live, and each year My Children and I have a lovely time picking them to make a crumble for dessert. A self portrait with a “clown make up”. 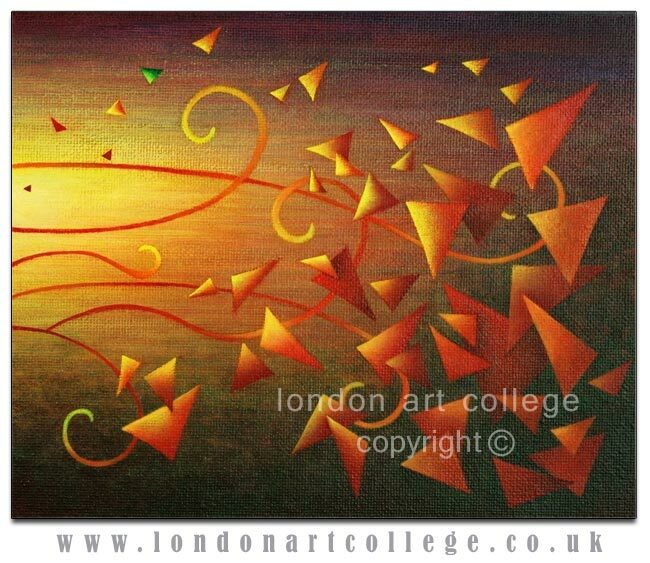 This is one of my first exhibition painting that was at Brick Lane Gallery in London last July. I completed the Pet Portraiture Diploma with the LAC this autumn. Back in April this year I decided I had progressed enough, and had paintings and drawings in my portfolio that I thought I could publish on a website. At the same time, although I knew I had progressed, I had nothing to measure myself against. Looking at art on the Internet is great and I had learnt a lot from this, but I wanted to compare like with like. I am a Brit living in Finland, a country with a population of only 5 million, and the only art society I have found so far, want members to have an academic art degree (preferably Finnish). 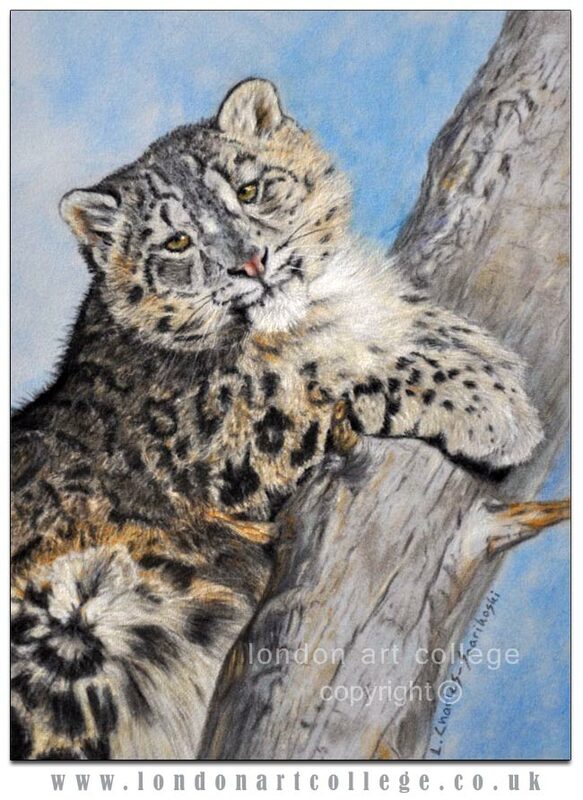 So I joined TWASI (The Wildlife Art Society International) and entered some paintings into their annual exhibition in Gloucestershire, UK in May. Now I had my website and I had entered an international exhibition. Who could I tell about this? Who would be interested? Could I get any publicity and get anyone from Finland to visit my website? My paintings were of some of the big cats at Helsinki Zoo, so I decided I could telephone the Zoo to get the email address of the marketing manager. I rang, and not only did I get the email address, but I got a chance to explain my story to the Marketing Manager herself! She was very pleasant and said she was interested in the story, and asked if I would email her with the details, which of course I did. I then carried my framed paintings in my hand luggage from Helsinki to Gloucester to the exhibition, and that was that. At the end of July I had an email from the Zoo asking if they could write about me in their August e-newsletter. I took all of two seconds to reply “yes”! I was asked what I do while at the Zoo, whether I paint and sketch and /or take photographs. Plus why I like big cats so much. I answered these as fully as I could, trying to make my answers as interesting as possible, and knowing they would probably be edited. On 2nd August I knew the e-newsletter had gone out as my website was extremely busy with hits from Finland! It was really great to see visits from all overFinland, and therefore from not just people who know me personally. I am happy to say that people still come from that link. To conclude, in making contact with someone who could be interested in my work, meant I got some free publicity to a targeted audience. Each person who subscribes to the Zoo e-newsletter has at least some interest in animals. Even if they were not thinking about buying art at the time they read it, many people now know about me and my art in Finland than before, and some of those people keep returning to my website. This was a big step for me, but in marketing terms, only a small step and something to keep building on in the future. With this in mind I followed up with individual “thank you” cards to the people who were dealing with the newsletter. The cards were my paintings of their cats and each contained a business card. They remembered me once, so hopefully they will remember me in the future. Also, I learnt a lot from exhibiting my work. I was not embarrassed as I feared, having my art hanging in the same exhibition at Pollyanna Pickering. Although I could see my paintings were better than some, I could also see that they were with the majority in that they were nothing special. I enjoyed meeting the other artists, especially those whose work stood out from the rest. I came away inspired, and it motivated me to improve and study more. Celia Carlile – runner up in Children’s Book Illustration Competition. We recently posted details of a competition to find an illustrator for a forthcoming children’s book, ‘Momo and the Totobrats’. 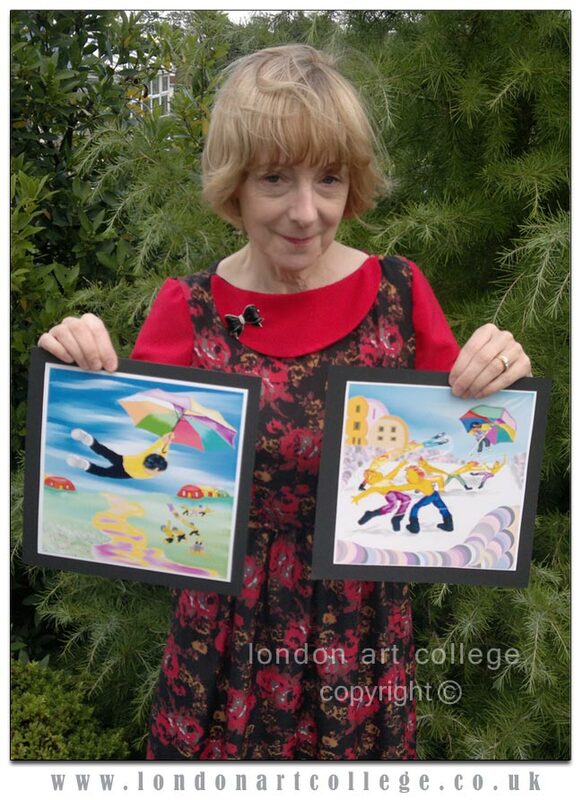 The runner up to this competition is one of our London Art College students Mrs Celia Carlile and we have added a photo of her with her artwork below. Celia lives with her husband in Ireland and says that she is very excited to be working on the forthcoming title, ‘The Slimy Slug’, by Wendy Hesketh. It’s a short picture book for the preschool market. We are thrilled to hear Celia’s news and wish Celia all the very best in creating her illustrations. We have a vacancy for a Painting and Drawing Distance Learning Course tutor for the Beginners’ Drawing (B1), Beginners’ Painting (B2) and Drawing and Painting Diploma (D1) courses. If you are interested please read the information below. other tutors also running the courses and be able to make bring a fresh perspective to the team and courses. themselves and are paid for each submission handled, on a piecework basis. The post requires a few hours per week in tutoring, which will start gradually as you take over the new enrollees. The tutor will be required to have some general computer skills. Tutors must be UK based. Most of our course tutors have been with the college for years and we operate in a professional, but friendly way.  Whether you have a full / part time job or work as an artist full / part time. I was thrilled with the comments Maggy made about my work and also for asking for it to be used on the website. I was doubly thrilled when Melanie asked me to write this blog. So please read my comments below which gives you a slight insight to the process of producing this illustration. I looked at the brief for this particular assignment and sat thinking for a while. So many ideas came to mind and I sat trying to work out how I could put them all across and also onto just one page. Here started the problem. I knew I wanted the ‘Travelled Around The World’ part of the brief to be the main theme but there were so many options and image ideas running through my mind that I decided it would be quite nice to incorporate as many as I could into one illustration. As I am working to quite a short deadline before the end of my course, digital seemed the right way to go and for me, it also had the correct feel for the brief keeping things soft but still light, colourful and strong. I decide to attempt this image digitally because I wanted the flexibility of being able to use different textures and colour changes without the need to have to restart my illustration each time if something wasn’t quite working. With Photoshop and Illustrator I had full control and could work on layers which helped enormously as I could play around with the background colours to get the right feel. I also wanted to get a 3D kind of effect to the main characters and this could be done much quicker digitally. I wanted to keep the main characters key to the image, but not dominate the illustration, I also wanted a page that would draw the reader in and give some interaction between child and parent. i.e. lots of things to look at and talk about. I tried to put forward an image that would explain itself if there wasn’t any text to tell the story. I tried to show the travel theme graphically by using lines around the globe which I think instantly tells the story and also by using transport illustrations around the border, it finished off the frame quite nicely. I wanted to appeal to boys and girls so used the squares pink/white border to hold everything together. Overall, I enjoyed working on this brief and look forward to my next ‘challenge’.